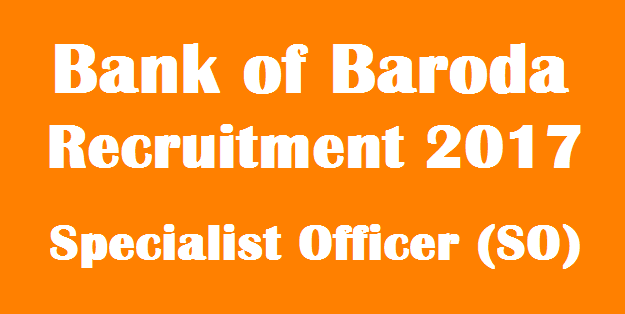 Bank of Baroda Specialist Officer (SO) Recruitment 2017 Notification, BOB Recruitment 2017 Notification Specialist Officer 427 Posts ,Bank of Baroda (BOB) has invites application from eligible candidates for the position of 427 Specialist officer in various disciplines. All Eligible and Interested candidates can apply online before 5th December 2017.BOB Recruitment 2017 more details are given below.. Candidates applying for the position of Specialist officer should have 2 year full time MBA or equivalent post graduate degree / Diploma with specialization in marketing / sales / Retail. The selection of the candidates applying for the position of Specialist officer will be on the basis of online examination. The age of the candidate applying for the position of Specialist officer will be according to the Notification. Interested candidates applying for any position of Specialist officer are required to pay application fee Rs 600/- for all other candidates and Rs 100/- for SC / ST / PWD through online. Interested and eligible candidates applying for any position of Specialist officer may apply online through official website of Bank of Baroda www.bankofbaroda.co.in from 14th November 2017 to 5th December 2017.